This sweet blue gingham baby book for boys is 64 pages of keepsake records of a baby's birth and first year. There are prompted pages to fill in, scrapbooking pages for photos and more, small envelopes for the hospital bracelet and a lock of hair from the first haircut, and 2 full pockets for assort.. 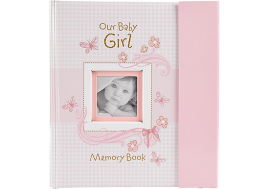 This sweet pink gingham baby book for girls is 64 pages of keepsake records of a baby's birht and first year. There are prompted pages to fill in, scrapbooking pages for photos and more, small envelopes for the hospital bracelet and a lock of hair from the first haircut, and 2 full pockets for assor..